Be a part of the solar solution. The Renewables truck is sporting some new graphics. Look for us around town! Ashley McGraw, a Syracuse architecture firm, is fitting out their new office spaces in the top floor of a high rise building in downtown Syracuse. They are aiming for LEED Gold certification and have asked Taitem to assist with the LEED certification effort. 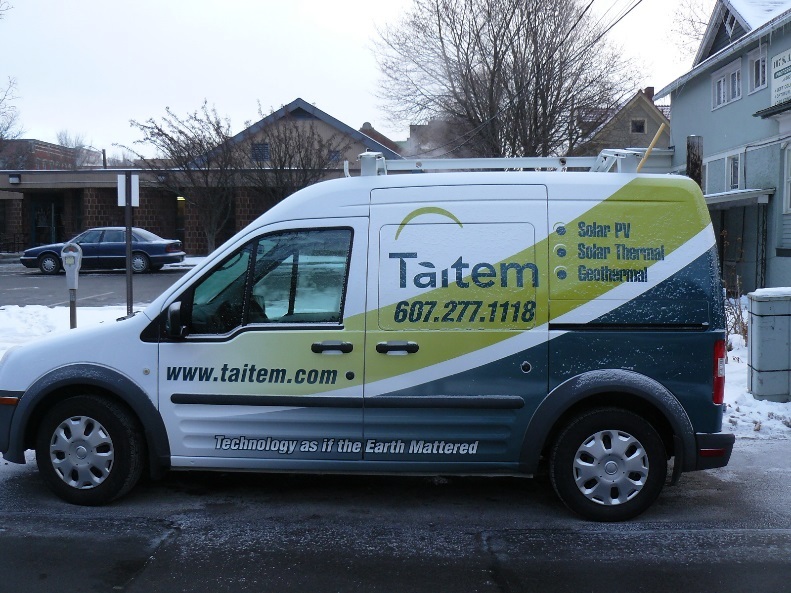 Taitem will provide support for the energy credits, some of the indoor air quality credits and will provide commissioning for the project. We’re hoping to help them get up to the Platinum level! Taitem served over 300 kWh last year to the electric vehicles that charged up at our EV charging station. In other words, we did our part in decreasing green house emissions by about 125 kg. Need to charge up your electric vehicle? Swing by our place on 110 South Albany St. in Ithaca. Want to see the future of buildings in NYC? Check out this video of the stackable units for being put together or take the A train to 4857 Broadway in Manhattan.